Sockeye Salmon is hands down the best fish in the whole wide world. 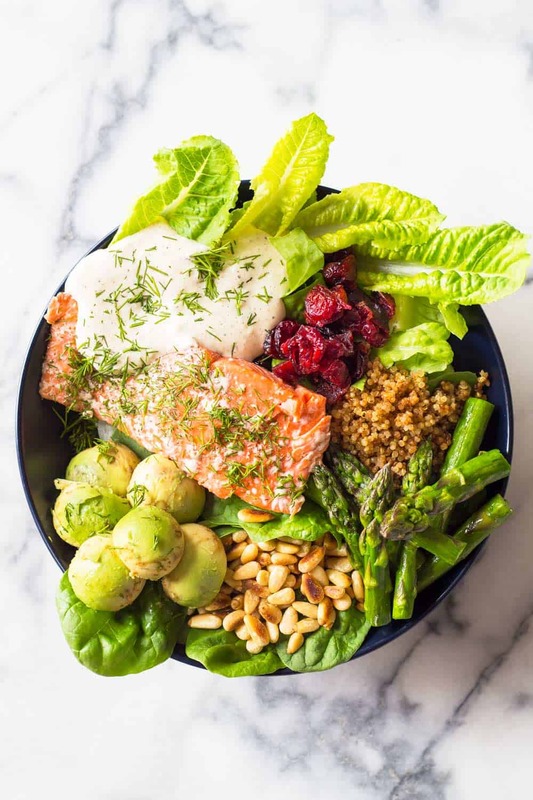 Pair it with lettuce, asparagus, pine nuts, cranberries and avocado, drizzle the best salad dressing ever on it and you’ve just made yourself the best Sockeye Salmon recipe ever! I don’t even know where to begin explaining how good this salad tastes! I mean I knew I was going to like it a lot. It has all my favorite things in it…. but I didn’t know it was going to be probably one of the best salads in Green Healthy Cooking’s history! Yes, for real! The combination of flavors, textures and temperatures is seriously unbeatable! You have crunchy fresh and cool lettuce paired with warm and soft salmon. Crunchy warm asparagus with crispy roasted Pine Nuts. Chewy and sweet cranberries and soft cool avocado. All this with a cold and super fresh and creamy Caesar dressing from Litehouse!! I’m drooling you guys, drooooling while remembering the taste explosion. For various reasons many people are always intimidated by non-everyday pieces of animal protein. I get it of course. We don’t want to make a mistake and then end up having to toss the valuable piece of fish or meat. With Sockeye Salmon there is little that can go wrong however. Don’t be afraid. It’s really super easy! 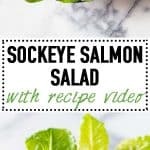 What goes best with Sockeye Salmon? 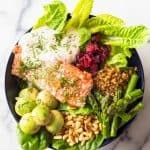 Sockeye Salmon tastes best with fresh vegetables in my opinion and topped with dill. Which is why I love putting it on a fresh fancy salad. Sockeye Salmon and asparagus taste awesome. Sockeye Salmon and quinoa taste amazing. Quinoa and avocado taste extraordinary. Pine Nuts on lettuce taste fantastic. And roasted pine nuts with dried cranberries taste out of this world. 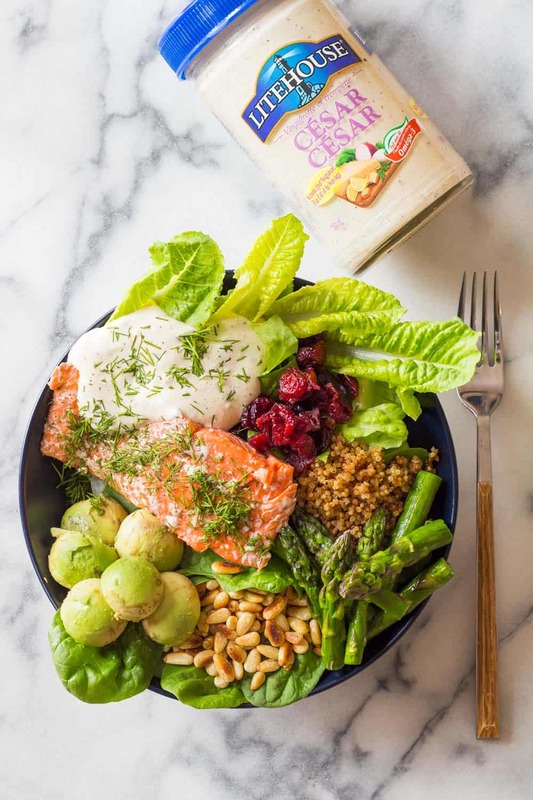 Now imagine a Sockeye Salmon Salad mixed with ALL these mouthwatering ingredients. It’s a feast! A real feast! Remember one thing though, a great salad needs a GREAT dressing or it’s completely ruined! Which store-bought dressing is the best? Picture this for a second. This was a real life event for me 2 weekends ago. You prepare an amazing salad to share at a picnic with friends. Chop tons of lettuce and veggies and carefully peel some citrus out of its skin, not only peel. You make a salad that’s extra pretty and make sure to pack it in a cooler bag with ice packs to keep it fresh. You even plan on making a great homemade salad dressing for it. Then you arrive at the picnic to proudly present your salad and find out…….you forgot to make the dressing!!!! Salad without dressing is like cold cabbage soup without salt. Ewwwww!! However, soon after, I found out salad with BAD dressing is even worse than that! The closest shop was a small corner store and we bought one of those gross room-temperature salad dressings that don’t need refrigeration because they contain more preservatives than anything else. It’s all they had and it ruined my salad. Literally, it completely ruined it! I was soooo disappointed! A couple days later I tried a couple different dressings from Litehouse for the first time and the only thing I could think of is, I so should have gone the extra mile to a larger supermarket with fresh produce section to buy one of these amazing dressings that belong in the refrigerated area of the produce section. Real veggies deserve a real dressing, now, even I learned, eh? 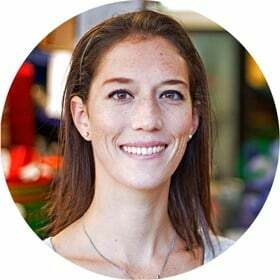 Big big shout out to this amazing company for sponsoring this post. You are awesome! I am so happy I was given the opportunity to try you dressings and create one of my favorite salad recipes with it. It was a real pleasure to come up with this recipe. And thank YOU, my lovely readers, for supporting the brands that support Green Healthy Cooking! 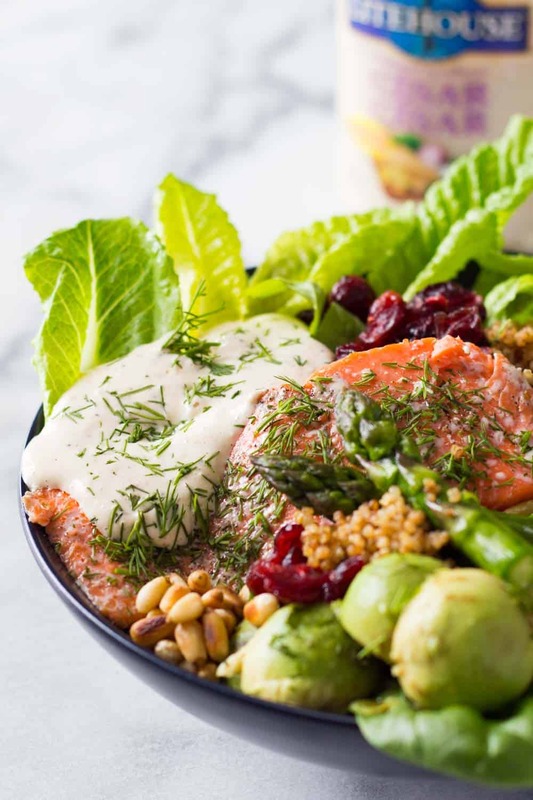 I hope you love this Sockeye Salmon Dressing with Litehouse Caesar Dressing as much as I did! Make sure to tag @greenhealthycooking when you post a photo of your finished salad. I’d love to see! Sockeye Salmon is hands down the best fish in the whole wide world. 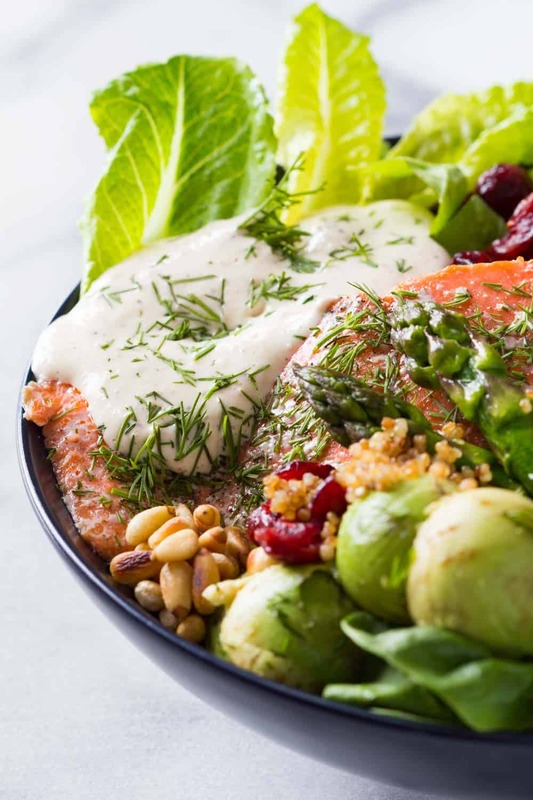 Pair it with lettuce, asparagus, pine nuts, cranberries and avocado, drizzle the best salad dressing ever on it and you've just made yourself the best Sockeye Salmon recipe ever! Oil an oven proof dish with some avocado oil and place Sockeye Salmon skin side down in the dish. Wash and cut up asparagus and lay evenly next to salmon. Generously salt, pepper and oil salmon and asparagus and bake for 15 minutes. In the meantime, roast pine nuts in a dry pan until slightly golden (about 3 minutes on medium heat). Set aside. Slice, wash and dry lettuce and baby spinach and place in 4 bowls. Top with roasted pine nuts, quinoa, dried cranberries, asparagus, salmon and avocado. Add Litehouse Caesar dressing on top of everything. Wash, dry and chop fresh dill and sprinkle mainly on top of salmon and ENJOY! Nutritional Information without Dressing. Dressing has own nutrition info on packaging. Looks like brussel sprouts as well? What looks like brussels sprouts? Love Sockeye, love Litehouse dressings! This is a win-win recipe! Looks fabulous. Pinning! Thank you so much Elaine!! !